The Orange Scud is one of the most effective all-season flies in southeast Minnesota and is a great, basic tie for a beginner. It doesn’t need to be pretty. Used in a dual-nymph rig is good insurance for a catch no matter what’s hatching as the scuds are in most streams year-round thanks to the (over? )abundance of in-stream vegetation. Hook: TMC 2488 size 14-16 (or whatever scud hook you like) or even a size 12. It may be true there aren’t any scuds in our small streams bigger than size 14, but I’ve caught a lot of fish on a really big, ugly, crappy size 12 scud. Back: I still have Gudebrod Metallic Braid that I use, but they may have stopped making that. Pearlescent Krystal Flash works fine too…find something that works. First, find the appropriately sized scud hook from your well-organized hook container or from that tragic mess of crap on your tying desk. My disorganization is well documented. 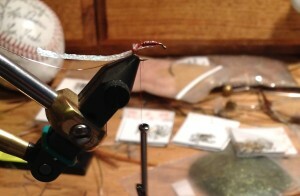 Thread and lead on hook and wrap over weight, ending your wrap at the back bend of the hook. Wrap and secure wire first, then scud back. Why? 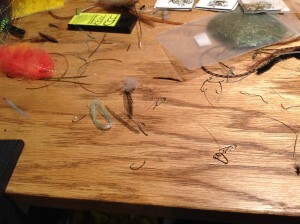 You’ll bring the backing over the hook toward the eye after dubbing, then wrap the wire up to just behind the eye. Dub your thread and wrap to just behind the eye. Pull backing forward, secure it down with a couple wraps of thread. Wrap wire up to just behind the eye, and wrap that down with a few wraps of thread, too. 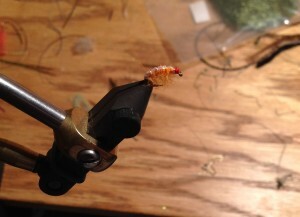 Then find something sharp and picky to pull the dubbing out from under the bottom side of the hook to give it that buggy, “hey I’m a shrimp and I’ve got legs” look. Oh yeah, I forgot that you’ll want to make a few finishing knots, either whip finish or whatever method you use. YouTube has bunch of great examples if you’re uncertain. 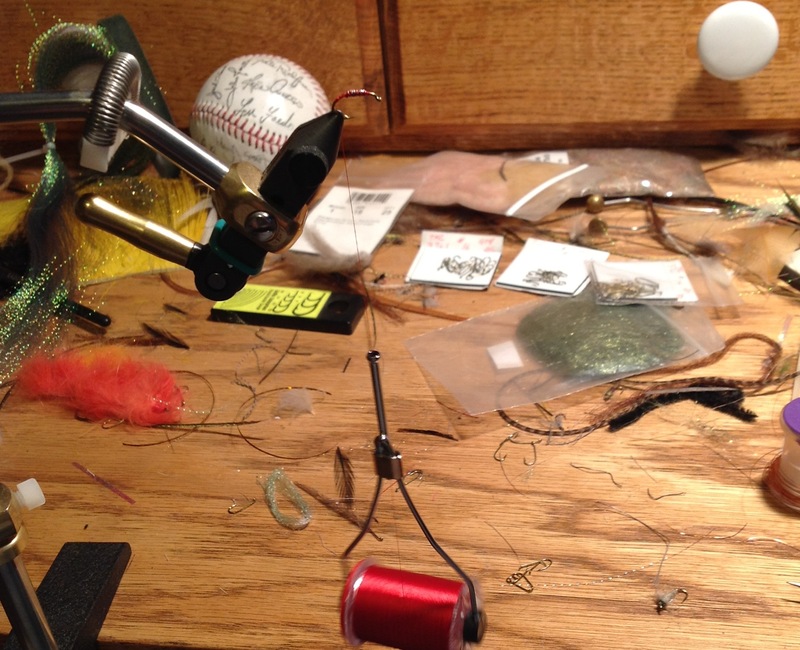 This entry was posted in flies on January 1, 2013 by Randy. 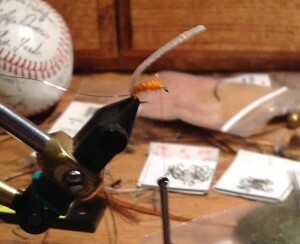 Randy, Loved your instructions and pics for tying a orange scud. You are my kind of guy …That’s not a crappy mess on your table it’s just organized confusion .